Unless you’ve been living way out in the farthest reaches of the Red Waste, you probably know that the sixth season of Game of Thrones will premiere Sunday night on HBO (which happens to be available as a free preview this weekend). Loving Game of Thrones is great…unless your life is filled with folks who have no interest in watching your “little dragon show” with you. If your friends and family have resisted all of your attempts to get them interested in watching, maybe all you need to do is revise your pitch. 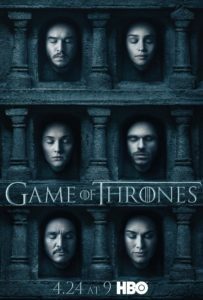 Think about what TV shows they watch now, and then highlight the aspects of Game of Thrones that should most appeal to them. For example, if your friend is into The Walking Dead they presumably like zombies. Tell them all about Game of Thrones’ ice zombies. What’s cooler than zombies? Ice zombies! American Crime Story, they’ll enjoy unraveling the early mystery of Bran’s assassination attempt, as well as the courtroom drama of Tyrion’s trial. Mace Tyrell is no Marcia Clark, but Oberyn Martell is at least as charismatic as Johnnie Cochran. The Bachelorette, then tell them all about the beautiful, imperious Daenerys Targaryen and the men who’ve captured her heart. She loved and lost the gorgeous Khal Drogo. She’s just not that into the loyal Jorah Mormont. And, real talk here, I’m pretty sure Daario Naharis isn’t there for the right reasons. NCIS, they’ll probably respond to another ragtag team of misfits working toward a common problem – the Night’s Watch. the “will they or won’t they” push and pull of couples on shows like Castle, New Girl, and, uh, pretty much anything on The CW, I bet they’ll fall for the bickering-with-potential-for-more dynamic of Jaime Lannister and Brienne of Tarth. The Americans, hook them on Westeros’ most slippery spymasters, Varys and Littlefinger. The Young and the Restless, General Hospital, or even classic teen dramas like Beverly Hills 90210, I think they’ll be captivated by Game of Thrones’ own soap opera heroine, Sansa Stark. Once Upon A Time, they’ll get even more magical excitement from dragons, White Walkers, and the mysterious red woman, Melisandre. Election 2016 coverage, but think it’s just not quite mean enough, just play them a few minutes of an average Lannister family dinner party. Finally, if your friends and family watch any of the Real Housewives franchises, you might just be out of luck. Westeros has nothing on the backstabbing, badmouthing, and general depravity of those ladies! Kris works on the Internet Marketing team at TDS Telecom and helps TDS Marketing teams achieve their online objectives through digital marketing and website optimization. She has worked in the digital marketing space for over 10 years, in product categories as diverse as shoes, banking, beds and pig farming supplies (really!). Kris has both undergraduate degrees and an MBA from the University of Wisconsin – Madison and therefore bleeds Badger red. She’s a veteran blogger on topics ranging from digital marketing to Wisconsin fish frys to the sweet necessity of ugly office sweaters. Nowadays, you’re more likely to find her on Twitter or Google+ expounding on the virtues of Homeland and Aaron Rodgers. In her spare time, you can find Kris kayaking or attempting to play her guitar.